When oranges were first cultivated, orange peels were highly valued. People extracted essential oils from the peels to use in medicines and remedies for indigestion and other illnesses. Orange peels are a source of health-promoting carbohydrates. Peels also contain healthy polymethoxylated flavones, which are plant pigment compounds present in all citrus fruits. To obtain health benefits, you do not have to eat raw orange peels, but you can add flavorful orange zest to foods and beverages. 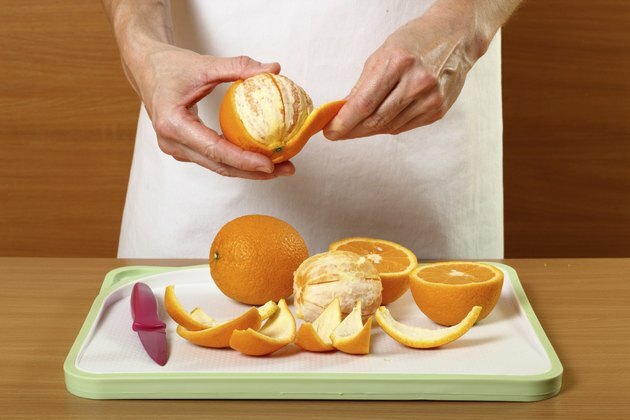 Using a grater, paring knife, vegetable peeler or citrus zester, make orange zest by shaving off thin slices of orange peel. The polymethoxylated flavones in orange peels have cholesterol-lowering properties. In a May 2004 "Journal of Agricultural and Food Chemistry" article, Canadian researchers and the United States Department of Agriculture reported that isolated compounds from orange and tangerine peels showed promise as a natural alternative for reducing LDL cholesterol without the side effects of mainstream cholesterol drugs. Orange peel and pulp contain hesperidin, a flavonoid that helps lower cholesterol and triglycerides. Orange peel is also a source of pectin, a natural fiber that helps reduce cholesterol levels. The phytonutrient called limonene is found in the oil of citrus fruit peels. Oranges, mandarins, lemons and limes contain large amounts of limonene -- an anticarcinogen -- in their peels. Limonene activates the body's antioxidant detoxification enzyme system and this limits the ability of cancer cells to grow. Citric acid helps starve cancer cells by cutting off their energy supply. People in the Mediterranean region have lower rates of certain types of cancers, and the main reason for this seems to be their diet, which includes the regular consumption of citrus peel, which is used in Mediterranean fish, chicken, lamb and dessert recipes. Hesperidin is a potent flavonoid in citrus fruits that is most abundant in the peel of the orange. Hesperidin suppresses precancerous lesions and may inhibit certain cancers including breast cancer and colon cancer. Orange peel is a very good source of pectin, which is a natural fiber that can decrease the rise in blood sugar that may occur after a meal. This can make it helpful for people who must watch their blood sugar. Pectin can also help diminish an overactive appetite, which may lead to unwanted weight gain. The pectin in orange peel acts as a prebiotic and encourages the growth of beneficial probiotic bacteria in the intestines. Orange peel is very rich in fiber, which helps regulate your gastrointestinal tract. Before it was scientifically confirmed, the peel of different varieties of oranges was believed to have medicinal value. Various cultures throughout history used it for digestive problems, stomachaches, indigestion, constipation, diarrhea and as an anti-spasmodic. What Are the Benefits of Papaya Enzyme Supplements?